ETCH FREE II is an acid based cleaner for use on acid resistant surfaces. It can be used for dip tank cleaning of aluminium or used for cleaning polished aluminium equipment and stainless steel. For Dip Tank or brushing application: For concentrated cleaning on highly stained areas, dilute with four parts water. When lighter cleaning is required, dilute with up to 10 parts water. Apply solution with a mop or a sponge. Allow 1-5 minutes contact time. Rinse with clean water. Do not apply ETCH FREE II onto a hot metal surface and do not allow product to stand on surface too long, because product may cause slight staining of metal surface. ETCH FREEII is safe on polished aluminum, chrome and stainless steel if used as directed. Please refer to the Material Safety Data Sheet for disposal and handling procedures. Why Should You Count on Us? Because we already have a reputation that is second to none, with a proven record our clients can bank on. So, why not buy products directly from the manufacturer other companies trust? Here are just a few. 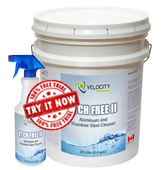 Velocity Chemicals is incredibly reliable and a great team player to work with. They are one of our core, premium suppliers.